Slim Jim / J Pole antenna calculator. This calculator can be used to design a Slim Jim or a J Pole antenna. The Slim Jim, designed by the late Fred Judd, G2BCX, can be a great portable ‘roll up’ antenna, if made out of 300Ω or 450Ω ladder line / twin feeder. Add a loop of string to the top, and hang it on a tree branch, use it with your handheld transceiver, then roll it up and put it in your pocket when done! 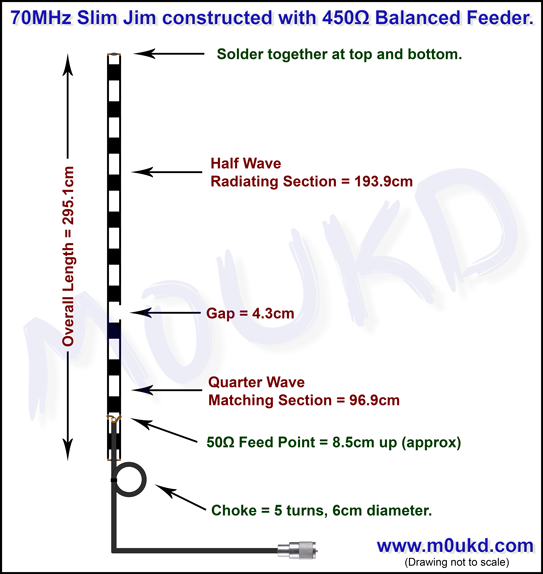 A Slim Jim for 2m (145MHz) will be 1.5 metres long, and 70cm (433MHz) will be 0.5 metres. Alternatively, for permanent installations, the copper tube or aluminium J-pole is a good choice. I have had good success with both, but regularly use the balanced feeder Slim Jim mounted on a 9m fibreglass pole, as can be seen in the photo at the bottom of the page. It is recommended to use some sort of choke at the feedpoint. Three turns (for 145MHz) of the coaxial cable around a 40mm former (PVC pipe etc), or taped up and hung freely is adequate. Five turns, 6cm diameter for 70MHz. I have also used a clip on ferrite or two for VHF. As with any balanced feed antenna, this will help prevent the braid of the coaxial cable from radiating, and becoming part of the antenna, and therefore affecting SWR and performance. You can check the effectiveness of the choke by touching the coax below the choke and if the SWR changes significantly, your choke is inadequate. The spacing between elements, I have shown as 45mm on 2 metres. This is not critical. It will have some effect on where the 50Ω feed point is, but i’m sure you’ll find it! The critical lengths are B, C, and E then adjust the feedpoint to find a perfect match. Ignore B and E if building the "J pole". All dimensions should be between the closest metal to metal (inside), not centre to centre. a 1.0:1 SWR will be possible when the antenna is working perfectly. If you cant get it perfect, the length of the elements may need adjusting or the choke is not adequate. Just remember, when adjusting elements, 1cm shorter on ‘C’ would equal 3cm shorter off ‘A’! *Velocity Factor: I have added the ability to select the velocity factor of your conductor. It is set by default to 0.96, which is for bare copper or bare aluminium. If you use balanced feeder such as 300Ω or 450Ω, adjust it to 0.9 (or set to the cable manufacturers specification if available). The diameter of the elements will also slightly affect the length. 50Ω feed point: The 50Ω feed point is a starting point and should be adjusted up and down until you get a 1.0:1 SWR (or as close as possible) with your antenna. 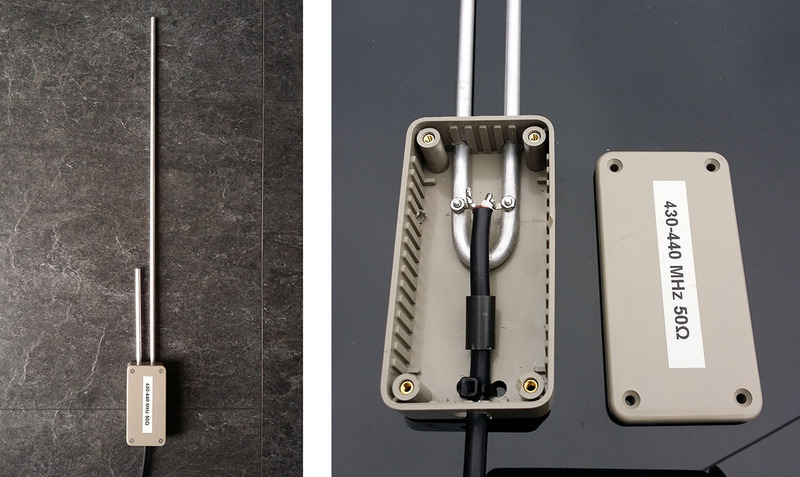 You could even use a 4:1 coax balun and feed it higher up the matching section. If you can’t find the 1:1 point, the elements are either too long or too short. This is where an analyser comes in handy. Tuning can be done by adjusting the length of the 1/4 wave stub ‘C’. I made one for 4m (70MHz) which is 3 metres long. The quarter wave matching section can be made horizontal, with the half wave radiator section vertical, 90° to it if space is an issue, although this will affect radiation pattern slightly. Just remember the whole antenna needs to be in the clear, away from any objects, especially conductive objects! So, how does this thing work? The Slim Jim, similar to the J-pole, is in fact a half wave end fed dipole, in the Slim Jim’s case, an end fed folded dipole. As with all folded dipoles, the currents in each leg are in phase, but in the matching stub they in phase opposition, so little or no radiation occurs from the matching section. You may think how can you say this is a dipole, when its just one element? Well, contrary to popular belief, the dipole is so named because it has two electrical poles, not two physical poles. Wouldn’t that be a di-element!? Just like a magnet has two magnetic poles, a North and a South, we have two electrical poles, a Positive and a Negative. Being a half wave, there is always two opposite poles on the tips at each half cycle. Any half wave antenna is actually a dipole. To help explain this, I have drawn above what happens to the voltage on a half wave element during one cycle. You can see, there are 2 poles, one positive and one negative at each half cycle. Hence, ‘dipole’. As its a half wave element, the wave is opposite at each end. Unlike the full wave example on the right, where the wave will join up if you imagine placing it on top of itself. Hopefully, this explains things, and shows that the Slim Jim is actually a half wave dipole. A dipole, is usually fed from the centre, where the impedance is about 70Ω. This provides a reasonable match to 50Ω coaxial cable, and is why the centre fed dipole is so widely used. 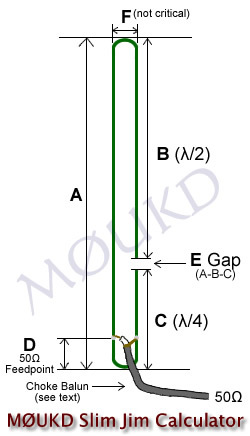 A dipole can be fed anywhere along its radiator, for example, the windom is ‘off centre’ fed at the 200Ω point, and an end fed half wave will give a very high impedance of up to around 5000Ω. coaxial cable, and is where the ‘J Integrated Matching’ (JIM) quarter wave matching section (λ/4) comes in. With the Slim Jim, you have the option to select the exact impedance you want, typically 50Ω. With the centre fed dipole, you have an impedance of around 70Ω. The matching section is just a matching section and does not radiate significantly. 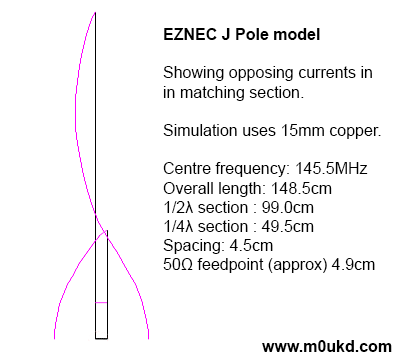 The ‘equal’ but opposite currents can be seen in the EZNEC model of the J Pole above, however, as one end of the matching section is not connected, it will have an infinite impedance. The other end of the matching section is connected to our radiator and although this is a high impedance point, it is not infinite, which is why some slight radiation of the matching section is inevitable. The more perfect the antenna is operating, the less this will be an issue as we will have the highest possible impedance at the base of the λ/2 radiating section if it is a perfect half wave. The 50Ω point can be found once you have built the antenna to the correct dimensions. Have the antenna out in the open, then move the feedpoint up and down small amounts, and when a 1:1 SWR is found, fix them there. An example of what the different impedance points may look like are shown on the image to the left. The calculator above will give you a good starting point, although spacing between the elements, velocity factor and other differences will have an effect on where this actually is. There are many rumours on the Internet, claiming that the Slim Jim has better performance than the J Pole. Simulation (and common sense) suggests that they are practically identical. John Huggins KX40 covers this question on this page. 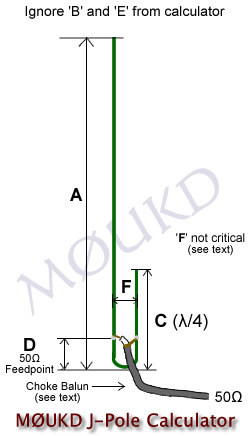 It is likely that any real world tests that show the Slim Jim to have better low angle gain than the J Pole is due to the (sometimes) poor way people tend to mount the J Pole by grounding the base to a mast or not choking the feedpont, as opposed to the Slim Jim usually being mounted freely. I build my J Pole antennas as a J and mount them insulated from any mast. Here is a working 4m Slim Jim constructed out of 450Ω feeder, the stuff with the solid core. I have built two of these and it should be easily reproducible and work ‘straight out of the box’! Dave M0TAZ using a 450Ω feeder Slim Jim on 70MHz. Below is a J Pole that I built for 70cm. SWR is <1.5:1 from 430MHz to 440MHz. I hope this has been of help to you. If you decide to build any of these, I’d like to know what you think of it and how you got on. Please leave a comment! Thanks, 73 John. Hi I was surfing for J-Poles for my FM xceiver and came into your page; I had not ever seen the slim so I’ll give it a go. I had made some trials with so-so results. Thanks for sharing the calculator; is a sound start to me. Hi John. Very useful information. I made a 2m version using standard 15mm copper water pipe fittings and it works really well. Many thanks! I was prowling around looking for 2M j-pole information a while back and happened onto your slim-jim calculator. I ended up building one for 2M and experienced a few ‘issues’ tuning the antenna to minimum SWR and such. Once I re-read your comment about “…needs to be in the clear” and relocated my antenna up and away from obstacles, I found that tuning it to optimum was a walk in the park. In the end, I have an excellent performer mounted in the attic that can hit anything in the valley. My next plan is to build up a slimjim for 455Mhz using 1/4 rigid copper. Thanks for your comment Rick, nice to know its working well now its got some space! I used the calculator to build a slimjim and it worked perfectly. The point I would like to share is that I built the antenna with copper wire on a 25mm pvc tube. then I enclosed the antenna with a 32 mm pvc tube. Even though I am already used Slim Jim ,Now I made another one as you published.It works fine. Thanks for the article . Do you have any suggestions for a choke for a 70cm band Slim Jim? I just used a ferrite bead for mine on 70cm. You can see it in the picture towards the bottom of the page. I’ve planned to build a SlimJim for 17m for the next Jamboree On The Air! I know, it is huge but we have a 35m crane for our antenna’s so that wouldn’t be a problem :). My question is: from the coax cable to the feedpoint is approx. 17 cm to both sides. Is that of any influence? Or should I keep the core as short as possible (and the mantle 35 cm)? Is the velocity factor of any importance on this frequency? I will use thin steel wire or old coax like RG58 or 213. Wow, that sounds great! Firstly, the 36cm (2x18cm) is only 2% of the wavelength, the same as 4.5cm is on the 2m band. It’s not an issue. There is no reason why you could have less spacing, say 20cm. It will still work fine. Yes, the velocity factor remains at any frequency. For bare uninsulated wire, use 0.96. For insulated wire or if you are using the braid of coax, then it will be slightly less. I would use around 0.92. I have not tried using the braid of coax such as RG58 or RG213. To save on wire, it might be worth making a J-pole as opposed to the Slim Jim at that frequency. Anyway, good luck and I’d love to hear how you get on! I live in the USA and was wondering if you had a non-metric (American) version of your calculator? We don’t use, or at least “I” don’t, the metric system much over here and I have no measuring devices that do. I understand, I was brought up with the metric system here in the UK. I always find Imperial calculators strange, as the results are given in decimal, but all imperial systems work with fractions! Hope that helps and good luck with your antenna building! Hi John, I’m trying to build a 146MHz j-pole and I saw the 70cm antenna you had on the last picture and nownI am really interested to know what material you used for that, and if it is rigid enough to be used on an antenna twice the length. The little 70cm j-pole is built from solid 6mm aluminium rod. I made the tight bend by heating it up with a blow torch to soften it. It is very rigid at that size, and I imagine one twice the length would be OK, if its mounted well. Good luck with your antenna building! Thanks very much for the calculator, I’ll be attempting my first 2m J Pole very soon. The one thing I was interested in was at what point on the J Pole do you mount the antenna to your mast? Also what do you use to insulate / mount the J Pole? Any help with this would be very useful. I use 15mm pipe clips to a small mount with ‘U’ bolts on it. This insulates it and is not a problem as long as its not too high up the matching section. I would not know what VF you would need, it would have to be guesswork, trial and error. You may never get it as good, depending on the properties of the PVC. I wonder if you feedpoint calculation is correct on the new calculator? Looking at http://cecs.wright.edu/balloon/images/6/69/HIBAL_SLIM_JIM_ANTENNA_NOTES.pdf who shows your old calculator and it gives D = 103mm not 50mm. I also have a friend who has an old calc which shows the D=81 mm for 145.5 mm. Yes, well spotted. I revised the formula a while back. It is very dependent on many factors, so can vary on design. I based mine on the standard 2m J-pole made from 15mm copper tubing. Use a thin-walled 200 PSI pipe rather than the schedule 40. Hi John, i just wanted to congratulate you on your great SlimJim calculator, i just made mi own for 2m (146mhz) and just wanted to ask you if you see any issues with this setup. I used 5mm copper wire for the antenna and velocity factor of 0.96 but i have to set the separation F to ~3.2cm. It says is not critical, but will it affect the length of the elements? I hope not. For what i read it sure affects the 50ohm feed point moving it upwards right?, but what else issues should i expect? It should be OK, have a play with the feedpoint and the 1/4 wave matching section length. Can i use this formula for HF Antenna ? i wold like to make an Antenna on 28.5 Mhz. I am going to make this Tomorrow. and i will up load the pic. here. if it done well. It will work, it may take some tuning. Any recommendations on building a J-pole on 40 meters band. I’ll use copper. Can you recommend tubing size? Thanks for your help. Necessity for this antenna is luck of space in back garden. Any better installing on top of the roof of my house? For 40m band, the J-Pole would be 30 metres in length! I don’t think that’s practical. Perhaps you could try a quarter wave vertical, although it would require some really good ground system. Thanks for the amazing work! Any idea what kind of power ratings we would be looking at for ladder line constructs? I’m thinking about a setup for supporting bicycle events. I would usually use an HT, but might need to add an amp when the terrain prevents the HT from getting through barefoot. The amp can put out 40-50 watts. This would likely be part of a cross band repeater on 6M, 2M, 1.25M and 70cm. Power should not be a problem. The highest current is at the very base of the J matching section, below the feedpoint. Yes you could build one for DAB. Just use the calculator and 225MHz. Hi. I can speak english but no very well. To write it, is other thing. I need to know how make a “choke balun” for an antenna in 28,325 MHz. Got hold of some 300Ω ladder line and going to do a 4m version like the one M0TAZ is using for when I am out with the car. 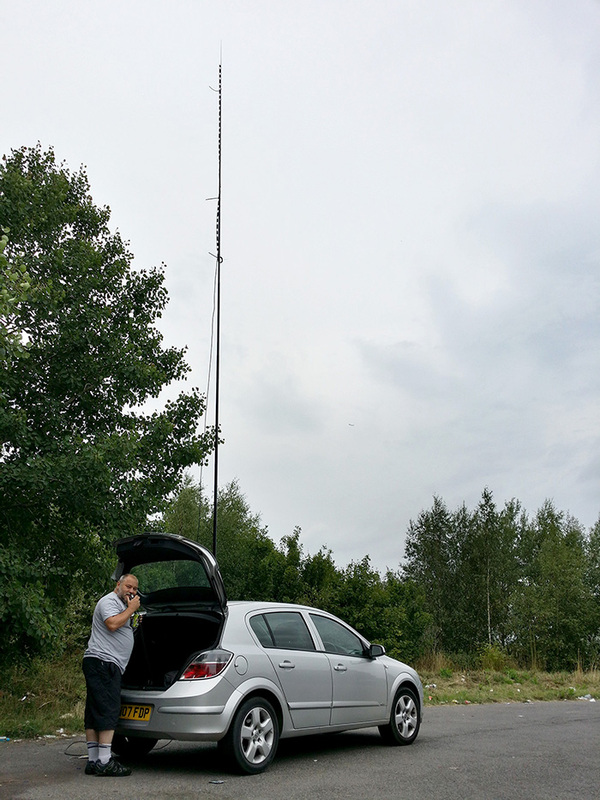 Getting a DK7ZB 6/4m 4+4 for SSB at home so loath to spend more money for a vertical for FM. Hopefully thanks to the calculator even a practical incompetent like me can do this!